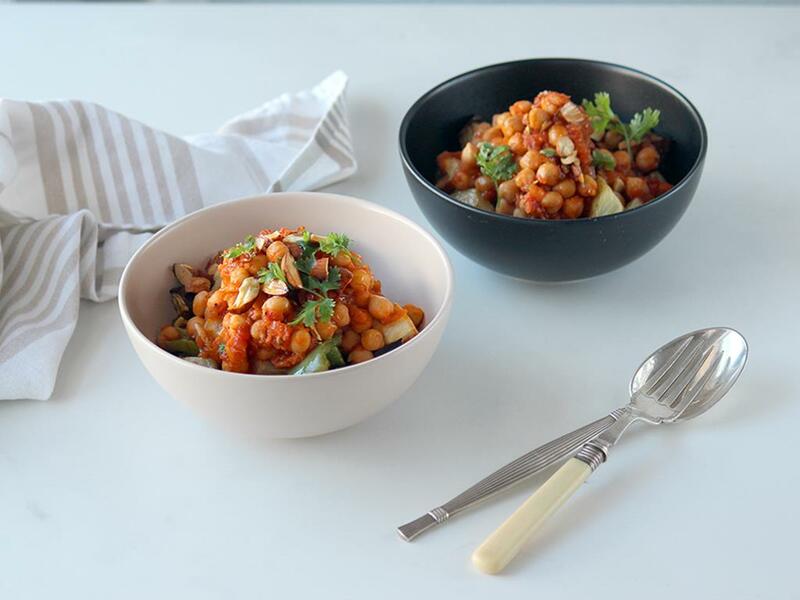 Chickpeas coated in a tomato & coriander sauce served with roast veggies & almonds. Roast veggies: Place the aubergine and potato cubes on a tin foil lined baking tray with a drizzle of olive oil and season with salt and pepper. Mix, arrange in a single layer and roast for 25 minutes. Then add the courgettes and peppers with salt, pepper and olive oil and roast for another 10 minutes until golden and cooked. Roast almonds: Place the almonds on a separate baking tray and roast in the oven for 8-10 minutes. Remove, leave to cool for a bit, then chop roughly. Coriander chickpeas: Place a pan on medium-high heat with a drizzle of olive oil. Add the onion with a pinch of salt and cook for 5 minutes before adding the garlic, coriander seeds, chickpeas and tomato paste. Cook for 1 minute then add the grated tomatoes and water (1 cup for 4; ½ cup for 2) and cook for 10 minutes until the sauce thickens. Serve by topping the roast veggies with the chickpeas, fresh coriander leaves and chopped almonds. "Was it easy to prepare? Yes very easy. Was there enough food? Yes, generous portion for me. Were the instructions easy to follow? Yes very easy. Really delicious dish, I added chili flakes to the chickpea mix just to pump up the flavour. Loved it!"